Waiting on a FMF 4.1 slip on which is on backorder for about a month. In the meantime I read on the earlier models to take the rear screen out. The 17' up appears to have two screens in the rear of the end cap. Do you just drill holes and use pliers to remove the screens. Note: There is still a closed cap with a captive spark arrestor screen in the front of the end cap. Oh and fueling will be controlled by a Vortex which is due in today. Who did you get the Vortex from? Im curious , if they just come programmed for stock bike with 10 different maps, or already have another map (set up) for modified bike. I bought it from the best dual sport guy. I'm not sure if he twists the dials to what he likes or not. He claims to program them so he may. I don't believe he reprograms them internally. I'm sure it comes with instructions and it's only a matter of turning the micro dials to re set it. It's hard to see but I'd think there is prob a cross bar going from side to side behind the screens. I doubt there's a stem running down the hole length of the pipe. The screens doesn't seem to be tacked onto the pipe it's self. I'm sure there is a better answer but I'd try the drill and pair of angle needle nose pliers and go really easy try and spin it to break it free. Whatever is left I'd grind off with a dermal. But I'm sure there is a better answer tho. The 2 screens are tack welded together at one point and are basically pressed into the groove. I cut a slit with a dremel and pulled them out with pliers. Just grab them with anything that doesn't hurt the endcap. 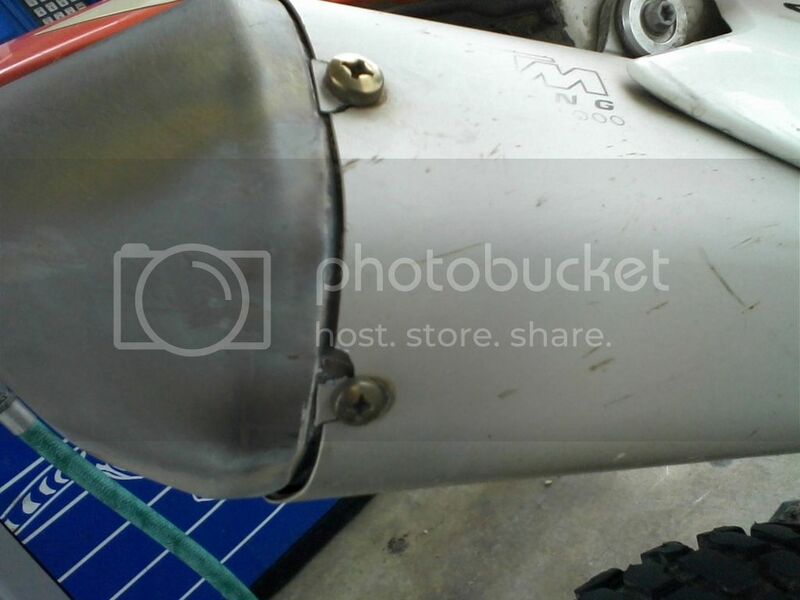 Don't go crazy deep with a drill and hit the spark arrestor is the only concern. yeah , best to do with end cap ON the bike, just drill the center out as much as possible, leaving an outside ring enough for punch to bite , take a punch and hit towards the center, screens will sandwich in and pop out. the screens themselves are not welded, they sit in a sleeve , and the sleeve is tack welded. Yeah he buys the sx vortex and tunes them for exc, you can also get them specifically with exc vortex manufacture tune elswhere for $100 less. not sure what the differences may be, but I am curious. Now you tell me. Well all I did was take off the end cap. So I'll put it back on and drill it out then use a punch. Hopefully a hole saw will work. Are you sure he buys the sx Vortex. I have only seen the Vortex $10. less but there was a taxing issue. For some reason the New bikes don't have an oring, for the end cap as previous years, that really helps seal the end cap, and cuts vibration. keeps this from happening, with high rpm use. sealant does seem to work as well. That's what he was saying in one of his vids, go to vortex site and look at dealer selection, 2 or 3 in California with Manufacturer tuned for exc. Check your Photobucket it's a goner. Well this proves the Vortex for a KTM 500 exc is for a 500 exc. You must be STOKED, if its as Good as its Price tag, Yee HIIII!! Be sure and post how it does, seems like the map switch would be nice too, easier than dealing with the oem. Just a follow up on the end cap, I blew up two mufflers, the first lasted about 300 hours, the second less than 100, but it was a used can. Im on the 3rd can now, but ensuring I utilize the oring and not just sealant. Blias racing has them for $10. Less.